This article helps you to add and remove a group from another group using Azure Active Directory. If you're trying to delete the parent group, see How to update or delete a group and its members. You can add an existing Security group to another existing Security group (also known as nested groups), creating a member group (subgroup) and a parent group. The member group inherits the attributes and properties of the parent group, saving you configuration time. Adding groups to a group synced with on-premises Active Directory. 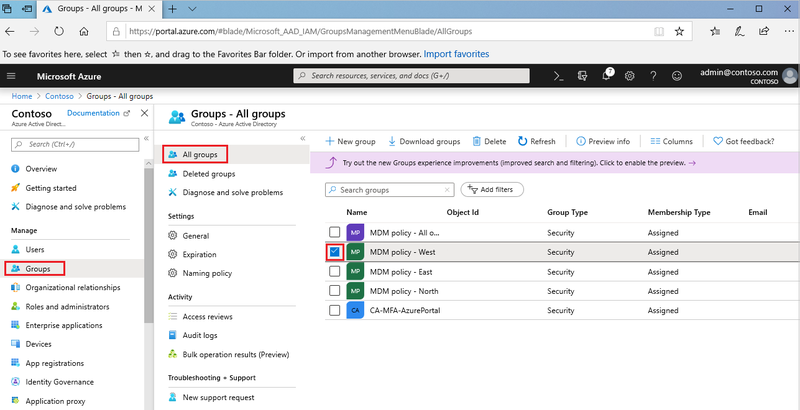 Adding Security groups to Office 365 groups. Adding Office 365 groups to Security groups or other Office 365 groups. Assigning apps to nested groups. Applying licenses to nested groups. On the Groups - All groups page, search for and select the group that's to become a member of another group. For this exercise, we're using the MDM policy - West group. You can add your group as a member to only one group at a time. Additionally, the Select Group box filters the display based on matching your entry to any part of a user or device name. However, wildcard characters aren't supported. On the MDM policy - West - Group memberships page, select Group memberships, select Add, locate the group you want your group to be a member of, and then choose Select. For this exercise, we're using the MDM policy - All org group. The MDM policy - West group is now a member of the MDM policy - All org group, inheriting all the properties and configuration of the MDM policy - All org group. Review the MDM policy - West - Group memberships page to see the group and member relationship. 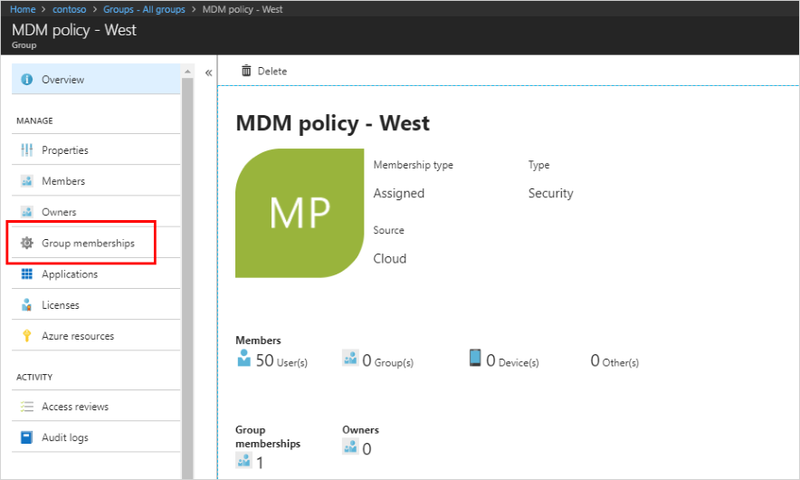 For a more detailed view of the group and member relationship, select the group name (MDM policy - All org) and take a look at the MDM policy - West page details. You can remove an existing Security group from another Security group. However, removing the group also removes any inherited attributes and properties for its members. On the Groups - All groups page, search for and select the group that's to be removed as a member of another group. For this exercise, we're again using the MDM policy - West group. 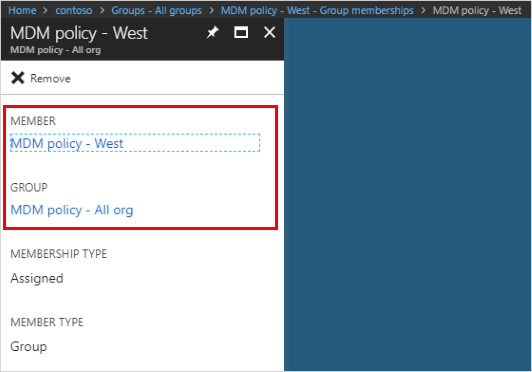 On the MDM policy - West overview page, select Group memberships. 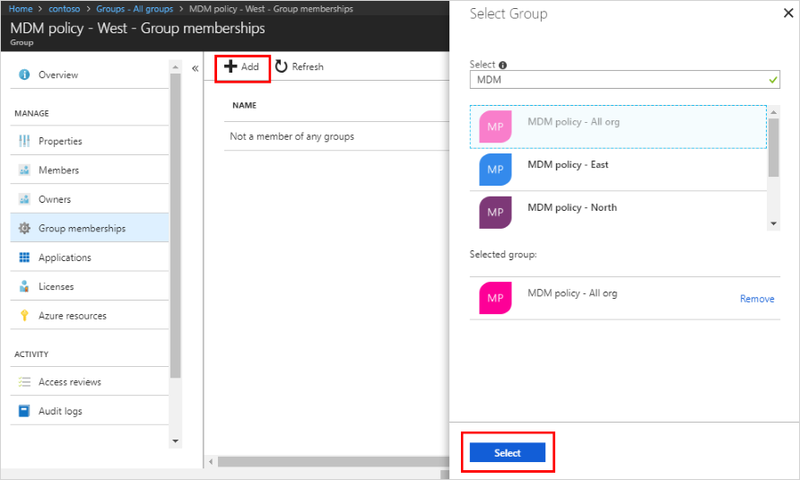 Select the MDM policy - All org group from the MDM policy - West - Group memberships page, and then select Remove from the MDM policy - West page details.